The team at Beauty Lounge are taking a much deserved mini break! We will be CLOSED Friday – Monday and reopen Tuesday. 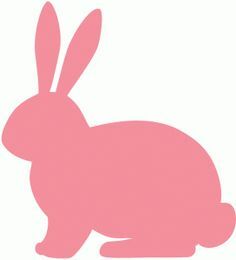 we are open 9am-8pm leading up to the break. Do you hate that peach fuzz that makeup can stick too? Are you after a deep exfoliation with no downtime? Do you want to get more out of your homecare products? Try our popular facial exfoliation treatment! This 2 in 1 treatment will not only leave you with baby soft skin, it will also leave you facial hair free! 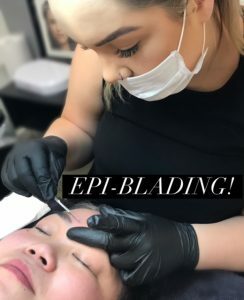 If this sounds like you read on..
Epi-Blading also known as Dermaplaning is a gentle method of deeply exfoliating the skin. A sterile surgical blade is worked over the face removing the outer layers of dead skin cells as well as any fine facial hair. There is no down time associated with the treatment. 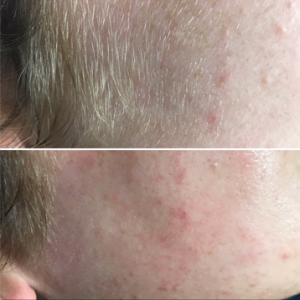 The treatment can be used as a standalone treatment or in conjunction with a hydrating peel or hydrating mask for better penetration of product. For best results we recommend a course of 4-8 treatments with 4-6 week intervals, although results will be seen with each and every treatment. *PLEASE NOTE: Any fine hair removed during the treatment will not be stimulated or grow coarse due to the nature of the blade and the method in which we taper the hairs. Here at Beauty Lounge St Kilda we are all about all things BROWS! Kat our superstar Director you all know and love has mastered the art of brow Microblading, and has been successfully trained in performing killer brows, so you can rest assured you are in very capable hands!For a limited amount of time you’ll be able to experience your choice of treatment of Ombre, Feather touch or Combination Microblading and at the promo prices listed below. Contact us back either via email or phone to book your appointment. A deposit of $100.00 is required for all bookings to lock in an appointment – this will be deducted from the total treatment price payable on the day of the appointment. If you wish to discuss the treatment there is a consultation fee of $50 each will be deducted from your full treatment price. Once booked please forward us your email so we can send you a Pre-care Microblading Form. Book in quickly, the brows you’ve always dreamed of are only a phone call away!